Vancouver, Canada – Leading Edge Materials Corp. (“Leading Edge Materials”) or (“the Company”) (TSXV:LEM) (OTCQB: LEMIF) is pleased to announce high grade lithium results from the first five diamond drill holes at the Company’s 100% owned Bergby lithium project in Sweden. Bergby was a new discovery by Leading Edge Materials in 2016, and this is the first drilling program completed at the property. Bergby lies in central Sweden, 25km north of the town of Gävle, secured by three exploration licenses that cover a total of 1,903 Ha. The site is close to infrastructure, with major roads, rail and power supply passing immediately adjacent to the claim boundaries. This first Bergby drilling program is now complete, with 18 short holes for a total of 533m drilled across a 650m long trend (see Table 1 and Figure 1 for drill collars locations and orientations). The pegmatite with potential for lithium mineralization was intersected in 17 of the 18 holes drilled and is now known to have a strike length of at least 500m. Holes reported within this release lie within a 50m x 50m area near an area of lithium mineralized pegmatite in outcrop, with mineralization drilled to date lying very close to surface. Intersections included elevated levels of tantalum (see Table 2 for all mineralized intersections). The true thickness of the mineralized interval is interpreted to be approximately 90% of the sampled thickness. Holes were targeted to test the extent of the lithium mineralized pegmatite beneath shallow glacial soil cover. Further drill results will be released as they become available. Europe is playing a leading role in the transition to low-carbon energy generation from renewable sources, and the efficient storage of that energy. Electric mobility (EV’s, HEV, PHEV’s) and stationary electricity storage are dependent on high purity graphite, lithium and cobalt, where Leading Edge Materials is an active European player. Lithium has a strong and expanding market, due to the essential role it plays in lithium-based batteries for the automotive, consumer product and stationary electrify storage industries. The high electrochemical potential of lithium results in the high power to weight ratio that is essential for efficient mobile batteries. Samples submitted by Leading Edge Materials Corp were prepared and analyzed by the ME-MS89L technique by ALS Ltd’s laboratories in either Pitea, Sweden, Loughrea, Ireland and/or Vancouver, Canada, where duplicates, repeats, blanks and known standards were inserted according to standard industry practice. The qualified person for the Company’s exploration projects, Mark Saxon, Director of Leading Edge Materials, a Fellow of the Australasian Institute of Mining and Metallurgy has reviewed and verified the contents of this release. Leading Edge Materials is a Canadian public company with principal assets in Scandinavia, a region well recognised for its promotion and investment in innovation. LEM’s flagship asset is the Woxna Graphite production facility located in central Sweden targeting the supply of specialty materials for lithium ion battery production. LEM’s core investments are matched to high growth markets, linked to the global shift to low-carbon energy generation and energy storage. Forward-Looking Information. Certain information in this news release may constitute forward-looking statements or forward-looking information within the meaning of applicable securities laws (collectively, “Forward-Looking Statements”). All statements, other than statements of historical fact that address activities, events or developments that the Company believes, expects or anticipates will or may occur in the future are Forward-Looking Statements. Forward-Looking Statements are often, but not always, identified by the use of words such as “seek,” “anticipate,” “believe,” “plan,” “estimate,” “expect,” and “intend” and statements that an event or result “may,” “will,” “can,” “should,” “could,” or “might” occur or be achieved and other similar expressions. Forward-Looking Statements are based upon the opinions and expectations of the Company based on information currently available to the Company. Forward-Looking Statements are subject to a number of factors, risks and uncertainties that may cause the actual results of the Company to differ materially from those discussed in the Forward-Looking Statements including, among other things, the Company has yet to generate a profit from its activities; there can be no guarantee that the estimates of quantities or qualities of minerals disclosed in the Company’s public record will be economically recoverable; uncertainties relating to the availability and costs of financing needed in the future; competition with other companies within the mining industry; the success of the Company is largely dependent upon the performance of its directors and officers and the Company’s ability to attract and train key personnel; changes in world metal markets and equity markets beyond the Company’s control; mineral resources are, in the large part, estimates and no assurance can be given that the anticipated tonnages and grades will be achieved or that the indicated level of recovery will be realized; production rates and capital and other costs may vary significantly from estimates; changes in corporate goals and strategies, unexpected geological conditions; and delays in obtaining or failure to obtain necessary permits and approvals from government authorities. Although the Company believes that the expectations reflected in the Forward-Looking Statements, and the assumptions on which such Forward-Looking Statements are made, are reasonable, there can be no assurance that such expectations will prove to be correct. Readers are cautioned not to place undue reliance on Forward-Looking Statements, as there can be no assurance that the plans, intentions or expectations upon which the Forward-Looking Statements are based will occur. Forward-Looking Statements herein are made as at the date hereof, and unless otherwise required by law, the Company does not intend, or assume any obligation, to update these Forward-Looking Statements. Table 1: Drill collars locations and orientations, Bergby Project. Drilling was conducted with “Wireline 56” equipment proving core with a diameter of 39mm. 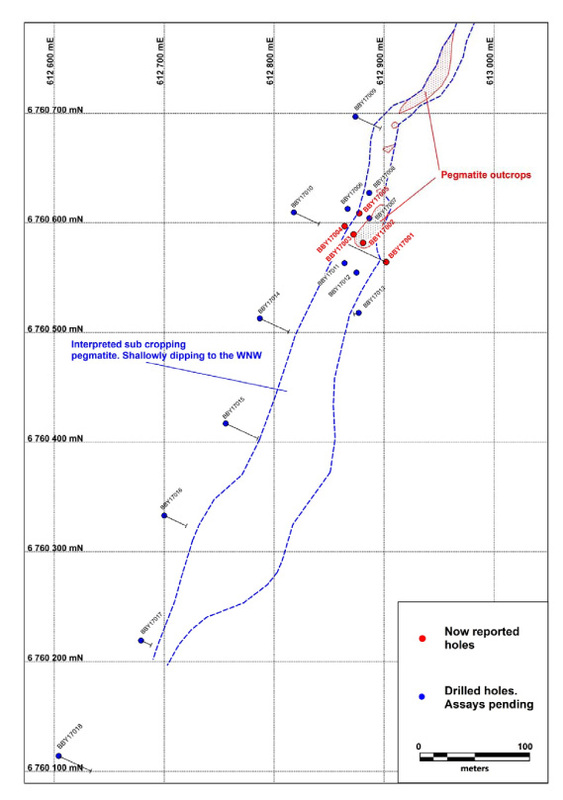 Figure 1: Location of Drilling and Interpreted Trend of Lithium-Bearing Pegmatite, Bergby Project. Grid presented in SWEREF coordinate system.